Dimensions: 2 1/2"H x 5 3/16"W x 10"D. Weight 1 1/2 lbs. 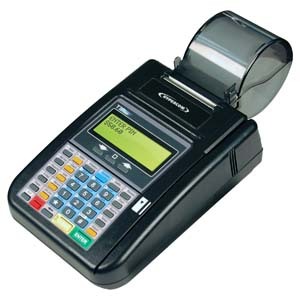 The Hypercom T7Plus is a ruggedly designed credit card terminal that can handle higher than normal abuse in field use. It offers a very compact design and a lower cost of ownership than most other competetive terminals. It doesn't come with a pin-pad but an external pin-pad can be easily added.